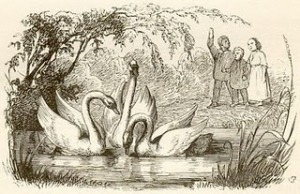 The Ugly Duckling by Vilhelm Pedersen. Just as Lois Sprengnether Keel got to the heart of her delicious Old Peter’s Russian Tale, “Little Prince Ivan, the Witch Baby, and the Little Sister of the Sun,” Sagacia’s cell phone went off, and Murzik lowered his ears. Lois and her listeners, however, were undaunted! Csenge Zalka, Tarkabarka to some, related the amazing tale of “Zal the white-haired prince and the Simurgh” from the Persian Shahnameh, and the Red Phoenix Terrie Howey wound up the swap on an oh-so-satisfying note with Grimm’s “The Little Pine Tree.” As Murzik swooned and stretched, guests chatted appreciatively. Simplia brought out plates and glasses, and Sagacia followed with lemonade and blueberry scones. At that moment, Nick noticed Sagacia’s book, The Princess and the Goblin by George MacDonald, on the end table and picked it up. After some nods of agreement then a moment of quiet, Sagacia looked around the room. “You all seem to be answering Pondering in Pomona’s question in the affimative,” she said. 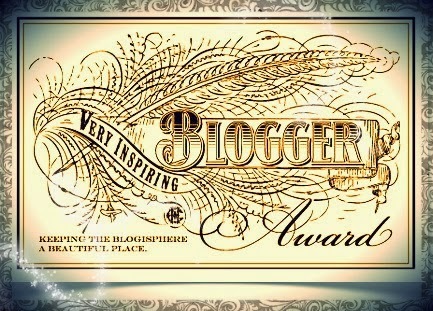 You are invited to leave your comments here on the blog,on the Storytell listserve, or on Facebook (Storytellers or Fairy Tale Lobby). I cannot believe I missed the Fairytale Swap at NSN Conference! And I had new fluffy blue wings in the armoire! It wasn’t my fault. It was that wizard at the bar! I love the old fairy tales…All of them, but particularly the ones written by D’Aulnoy and her lady friends and the ones written in the Victorian era. They all have marvelous points of view and call out for changes in the way things are (or were!) As well as magic and witches and enchantment etc et al. But what say you to the idea that our new fairy tales are science fiction? That that is where the marvelous transformations and magic is happening? Robin, I’d love to hear from some folks who are better read in SciFi than I am, but I am inclined to agree. There are modern tales which include some of the elements of fairy tales such as magic or enchantment, but some science fiction/fantasy writing approaches the intricate morphology of the Russian skazki (as described by Vladimir Propp) and includes a transformation of the protagonist which is downright inspiring to the reader or–often–moviegoer. I think the first Star Wars movie had that affect; and “May the Force be with you” became an admonition as compelling as the invitation from a magical friend: “Whenever you are in need, call my name/feed the doll/burn one of these three feathers/do such-and-such… and I will help you.” Ursula LeGuin is one whose books have “the Fairy Tale effect” on me, and Philip Pullman, and…. I appreciated some of the previous comments observing that modern fairy tales are published as books, hence classified under the author’ name and shelved alphabetically with fiction.